You are too funny Brandi! I'm so impressed that you walked so much at the Y. Nice Job! You're doing so great! And off a bunch of your meds, that is so good. And it's only been a week...less than a week! I was glad you left a link to the Cylons since apparently I didn't know I was one! Glad you are doing better...call me...no wait...email me, when you are in need of something! Not IF, but when...there is a difference! Way to go on the progress! I'm excited to follow your success. I hope you get your PBH soon. 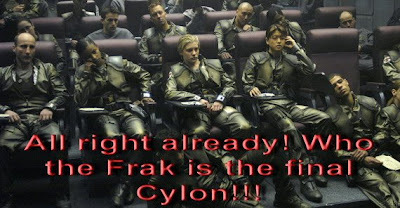 Don't tell me who the 5th Cylon is! We missed the 1st episode and Matt is threatening to not let us watch the whole season until it comes out on DVD. Maybe I'll cheat and go look at spoilers now and tell him I know what happened so we HAVE to watch it! 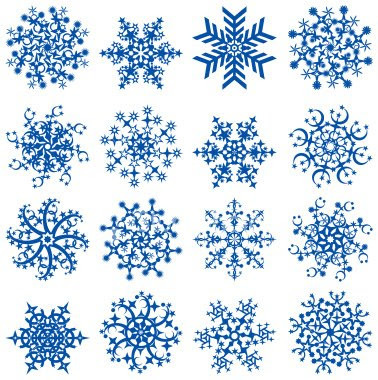 Wow, what a difference a week makes! Or almost a week. That's amazing! I should admit that I don't watch Lost or Battlestar though Cortney does. I did try to watch Lost, but I don't like shows with big casts long-term. I can't keep track of everything. Glad you get to watch! Soooooo, who where what why? I knew a total of TWO people that you were talking about and I am failing at my new years resolution to watch more TV... though Am. Idol is tomorrow. Don't laugh. That depends. 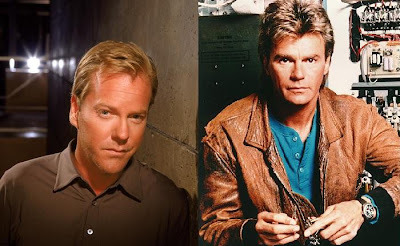 Does MacGyver have access to some chewing gum? How about a paper clip? Frak! (Sorry I just said it because your sister said to never say it and I'm contrary that way.) My head almost exploded. I couldn't wrap my head around that. Really. We are all cylons! And Ellen?! Shut the front door! She annoyed the crap outta me! Am I the only one still pining that it might have been Callie? or Billy? That would have been awesome...Dee does her (incredibly WTF moment, you'll see my blog for those thoughts) thing and then whoops, Billy is the final cylon and he still loves her. Okay...seriously, as soon as Lost is on, then I will do my tv blog about BSG and Lost. Remember the boat blowing up?! Sun crying for Jin?! Heartbreaking! Now...go you for the walking! And I totally know what that's like..the craving of sorta mundane food. I was there and I was miserable. The Lord is always showing us he has a sense of humor. I think it's just for folks like us who have a vacation spot in Babylon! Glad you are doing so well and can't wait for the after pictures! I can't believe you walked 4 miles and it's been less than a week, and like Monique said, on a liquid diet!!! You're crazy! But if it feels good, awesome! I'm looking forward to the picture updates this year--especially since I'll be going the opposite direction with pregnancy not ending until May. I too can't wait for lost tonight. 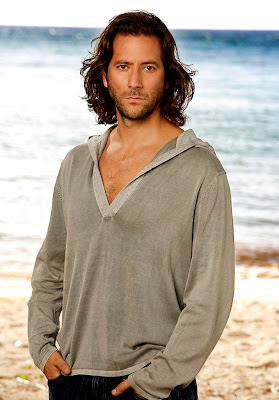 Umm Love the picture of Sawyer and Desmond, but I do love Jack!!! Where is his super hot pics??? I guess he is not your fav. what's up with that? MacGyver, BUT he will only barely survive. I love you forever and always for saying FRACK! I totally screamed bloody murder because ( okay I kinda guessed it was ----- way back in the day and I've been waiting for her to show up ever since) ewww DEE!!! I mean OMGWTFEWW!! Why her? I mean shes as useless as Felix and hes got more reason to do himself in! I wonder if she made more money than the other guy and it was budget cut time? And I seem to be the only person in the world who thinks Sawyer *swoon* lost a bit of definition in the ab area. Not that it'll stop me from looking, mind you!